Despite the contingencies and the limitations imposed on our appreciation, the entire history of art offers itself up to us, along with Western and Eastern culture. Who, among us, has never heard of the symbolism of stone in Japan and China? For Marie Hélène Allain, as for the Japanese artist, stone has a life of its own and can transform itself. The slow pace of the changes that act upon it is a symbol of resistance and of strength, for those who are inspired by this element because of their naturalistic leanings. The sculptor calls herself a daughter of nature ‑ not the flowers and birds celebrated in banal poetry and conventional art but nature as an implacable and unavoidable force, nature that is simply that power to which we must submit or which will cause us to perish. The work sponsored by the Beaverbrook Art Gallery, in Fredericton, N.B., did not impose the same moral obligations as that of the religious community. In contrast to the Hommage à Mère Marie‑Anne, it seems to rise out of the secular world. Where Mère Marie-Anne leans towards the sublime, to vision, to exaltation, the aesthetic category in which No 81, Awakening / Éveil (1985), can best be placed seems to be that of « beauty ». The proportions are harmonious and measured. Unity prevails over the flow of the lines in Hommage à Mère Marie-Anne. 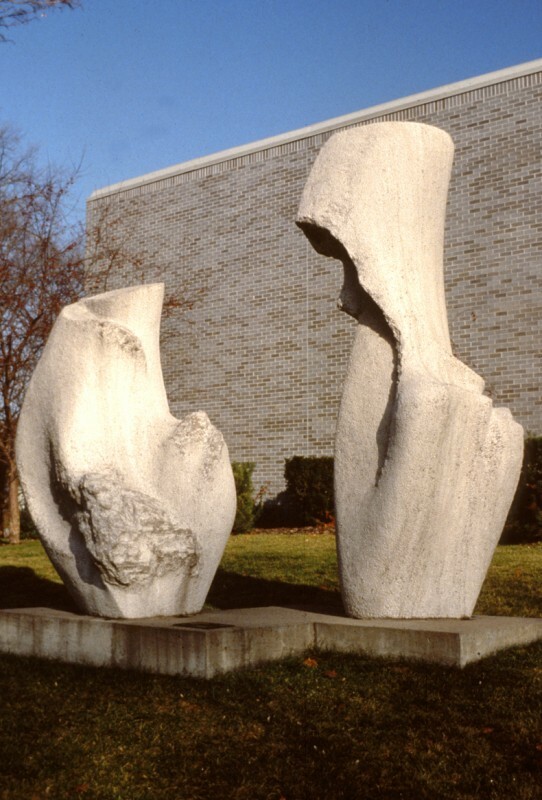 The work is composed of two interacting monumental figures, one of which dominates by a slight unbalance in its shape. To complete the design of this figure, the eye must situate it in a larger whole of oval configuration. From whatever place we are viewing the piece, in fact, an egg‑shape can be seen. The abstract character of the whole identifies the work with the priority of « doing » and with the precedence of the « object » rather than with preoccupations of more conventional representation and meaning. 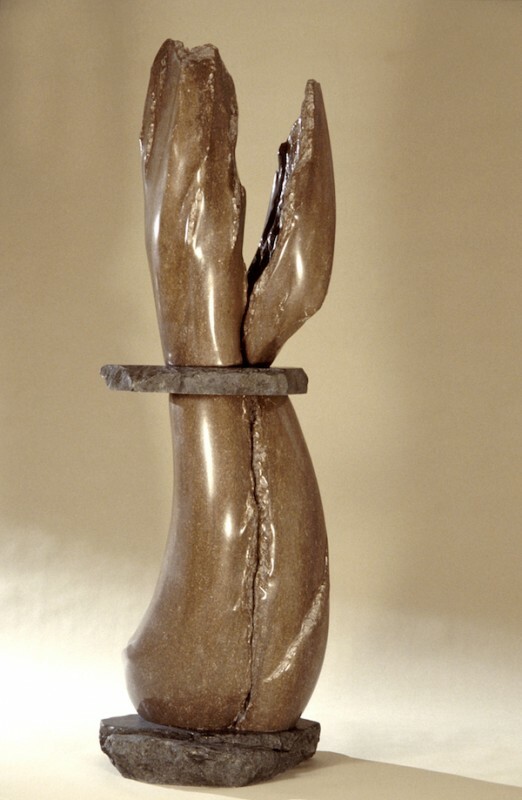 Even if we can make out the representations of figures, it is the abstract interaction between the two forms that is important, and along with it the interplay of tactile, linear and formal elements that have always remained at the heart of sculpture, even in the illustration of specific subjects. 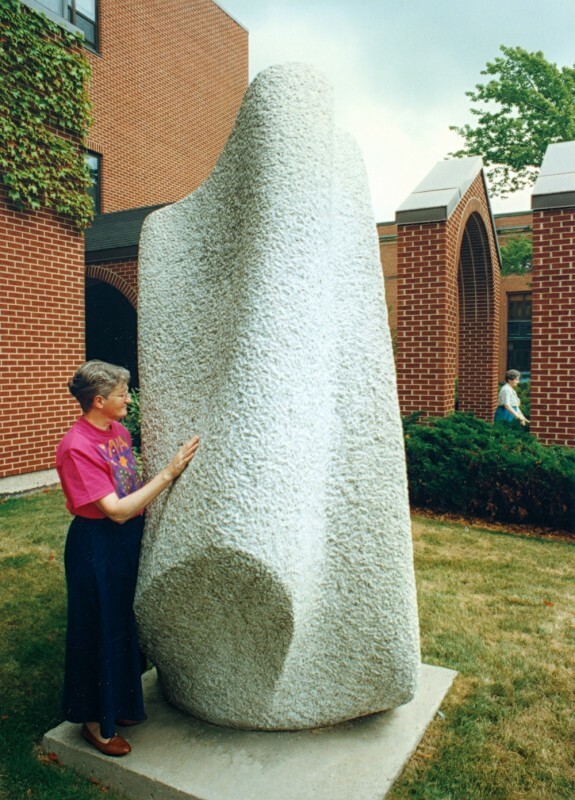 This monumental sculpture, in Campbellton, (No 80, 1984) is entitled Marie‑Anne. The title’s meaning has strong, personal connotations. For the artist, this name brings to mind that of a friend and her own. The two forms are not as dependent on each other as are the ones in the Fredericton piece. While there is a force of mutual attraction, space circulates freely between thern while they seern to dance in circles on their base. For us, their biomorphic aspect associates thern more with the vegetable and mineral worlds, although the large proportions of their joints make thern move like human beings. 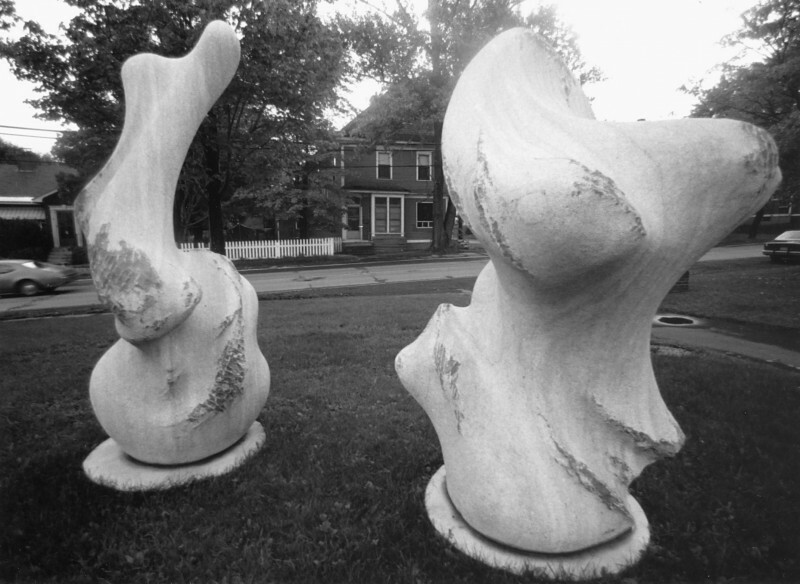 Marie‑Hélène Allain, during this period of commissioned pieces from 1981‑1986, wrote that her sculpture « represents figures rather than a single attitude or a single state of being. These figures are an invitation, communication, harmony… and other things 1 cannot put my finger on. » Representation, here, coincides precisely with abstraction. The subject, that of interacting characters, is only faintly suggested here, and may not be perceived by the majority of viewers. What else do we see in these highly accentuated curves, if not a movement that spirals up from the rounded base? The inspiration of this public sculpture seems to be largely naturalistic. Its naturalism can be fully expressed because the artist remains free of any inhibition in regards to whatever subject or representation she chooses. She apparently saw in this piece an encounter, various aspects of a feminine personality, whence the double name given to the work, but no other justification except a formal one is necessary for us to be able to appreciate this creation, which remains open to many interpretations. The most notable commissioned piece, besides Hommage à Mère Marie‑Anne, is no doubt Ocean Bone / Oeuvre d’océan (No 74, 1982-1983). What can we make of this title? The artist wishes to guide the reading of this work and to extend it. As with the choice of materials and form, these titles are meant to be revelations. 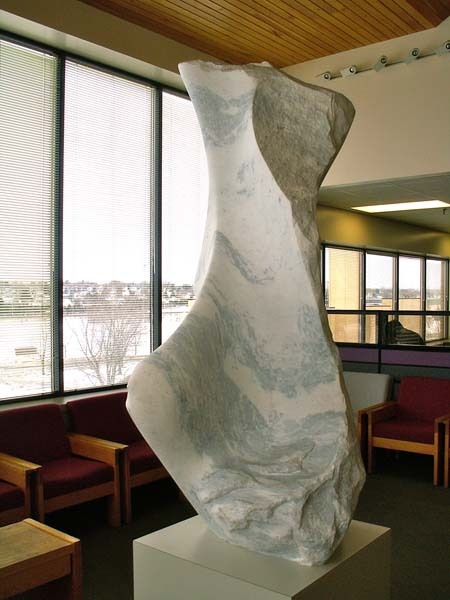 This sculpture, a single piece, was produced before the ones in Fredericton and Campbellton. More of an « object » than the Campbellton sculpture, more obviously grounded in our universe than the one that Mère Marie‑Anne represent, Ocean Bone / Oeuvre d’océan has an eerie, mad, humorous, playful, wry quality. In some ways, this sculpture reminds us of a children’s playhouse that we can scale the sides to climb into. 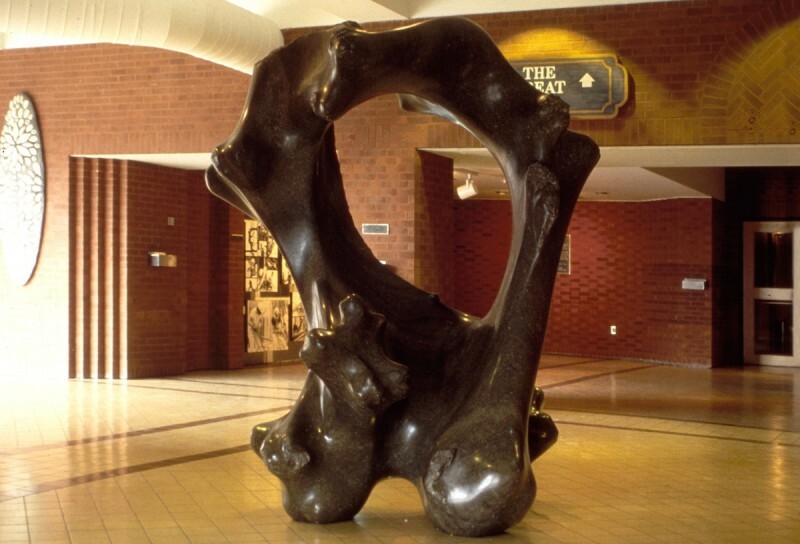 Situated in a shopping centre, placed in plain view of passersby, framed by other sculptures, it can only be identified as a sculptural object. Its function, if it has one, is not to teach or to tell but to amuse and intrigue the passerby as he or she stops to look for a few moments. There is a perfect balance among the formal mastery (the balance of the masses is very skilful), the materials (the alternations of polished and rough surfaces are a tactile pleasure) and the naturalist subject (animal bones), which throws into the midst of hurried pedestrians this gratuitous, lively, free creation, which seems to have been washed up out of a nearby sea… it looks as though some sand has been dragged in along with it, and that the sea has polished this fantastic object with its waters.